1. 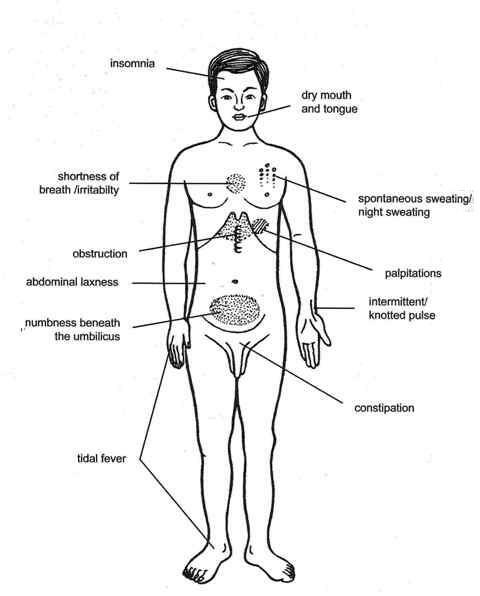 Both qi and blood deficiency marked a knotted or intermittent pulse; palpitation emaciation; shortness of breath; and a dry, pal and shiny tongue with less saliva. 2. Consumptive Lung disease manifested by dry cough, scanty phlegm, or cough with bloody sputum, emaciation, shortness breath, restlessness, insomnia, spontaneous sweating, night sweating, dry mouth and throat, constipation, or tidal fever, and a feeble and rapid pulse.